Our scavenger hunt games come with 5 copies of the task list so you can easily print off the file for 5 teams. It is optimal if you color code the teams so when they are out and about, they can spot each other - especially for games that have spy worthy tasks. Our standard colors (1-5) are shown below and this is what you will receive - one 6x9 envelope of each color, 5 envelopes total. We have additional colors for an additional 5 teams (we understand white and gray are not colors, but we'll treat them as such for purposes of team distinctions). These additional colors are shown below and can be added by the drop down box above. We only carry 10 colors total, so if you plan to have more than 10 teams, you can order duplicates and have 2 teams of each, etc. 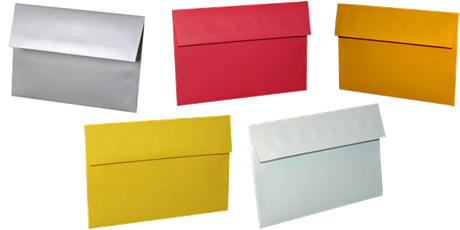 The above envelopes are the alternate colored envelopes #6-10. 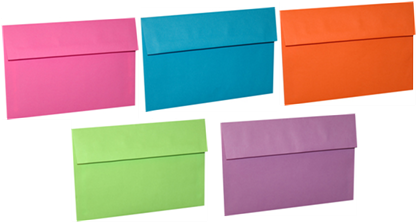 There may be slight variations in colors of envelopes. We are unable to mix and match colors.